Warning – a woman who was envious of the movie 13 Going on 30 wrote this article. I have always been waiting for this life chapter. My brain always shrugged off the “glory days” of high school and glamorized the mid 20s to 30s. Here it is folks – the Real World is all that I hoped. But every new pet urinates indoors a couple times. 1) Nobody is providing you with a list of goals to check-off. There isn’t a syllabus for your new life. This may or may not be exciting for you. It was for me. WOOP – I do what I want. But then it occurred to me – what do I want? Cue Monthly Goals! Confession: I enjoyed a few months of thoughtless floating through my new career… Until I realized just that – I was floating. And floating isn’t cool (especially if you are George Clooney in space). To guide myself back to a path of progressive self-improvement, I began a life of goal setting. I gave myself yearly goals, e.g. strengthening Spanish language skills. At the beginning of each month, I reevaluate my yearly goals and make a couple monthly goals, e.g. read a Spanish-language book. Where I still need to improve: 5 year and 10 year plans are non-existent (shocker, I know, sorry to disappoint). 2) Don’t forget to keep connected! Always be building & maintaining relationships. Through college, you have built career-benefiting relationships. Don’t lose them! Don’t confuse starting your career with stopping your networking. Careers evolve with time and that evolving means changing positions, companies, and careers. As I am sure you know, it is all about whom you know. Continue to get out in the community (or social networks) and meet new people. Reach out to your current friends and have coffee every so often. Limiting yourself to the view from your current desk limits your future views. Idea: get involved in local professional organizations such as the Chamber of Commerce. The Duluth Chamber has a young professionals branch called Fuse. 3) Believe me or not, nonfiction is actually fun. Guess what; I don’t want to frighten you (especially since Halloween is over), but there are 21 million college students in the world right now. That number will be growing. People will always be learning. Don’t stop learning just because you’ve left school. Keep learning. Stay informed. Be relevant. The world is full of literary treasures to help continue your growth. And many of them will make you laugh (or even cry, if I may be so bold). Make the choice to read something other than BuzzFeed (unless your “something other” is nothing… then BuzzFeed will do). 4) Budgeting isn’t just for making sure you can pay for college. Sorry friends – this necessary evil must continue. The vote is out on whether money can buy happiness, but the Real World agrees that by managing your money you will avoid stressors. 5) Schedule out your free time too – it goes quickly. This new 9-5 lifestyle brings a life of free nights and weekends for you to allocate as you please. But as I am sure most computer-wielding folks are aware… many an evening (or full day) can pass in the grasp of Netflix. Procrastinating on homework is no longer a worry, but your new life has new to-dos that can be sidestepped just as easily. Plug in your workouts, schedule some time with friends, and write down when you’ll run to Target to get new light bulbs. Using my calendar to remind me of what I should be doing has increased my productivity and grown my feeling of accomplishment. Bonus: The best is yet to come! Get as excited as me folks. Our life is going to be great. Editor’s Note: We’re welcoming Abby back for a guest post! Check out all of her previous work on the blog from when she was a student. Last summer I read a book that has stuck with me for this whole past year. The book swept the world and was labeled “revolutionary.” Oprah Winfrey even deemed it, “the new manifesto for women in the workplace.” But don’t leave yet, men! Lean In by Sheryl Sandberg is a book to benefit all people. When faced with the opportunity to talk to someone you admire in a position of power at a company you want to be at… do not be generic. Stand out. That’s what Lori Goler did to Sheryl Sandberg while at Facebook, and it worked. One of the things I’ve found hardest while being in the “real world” for this past year is that there is no right path/answer (even though half of my brain still tells me that is the wrong answer! <- see?!). Do not let the “what if’s” take over. The only choice you have is to make the best decision you can and in that, be confident. It will be a different one than the choices your friends make, but that is ok. Lean In says never feel guilty or resentful. There is not an exact perfect fit out there when you’re starting a career. Don’t pass up an enticing opportunity while you’re learning. Ok… this one is a little girl-specific, and it also has some Lean In inside jokes*. I shared it anyways because I found it to be the most profound. This quote means that you cannot wait to be adorned with the success and happiness you feel you deserve or want. You must go out and achieve it on your own. Promotions won’t (never say never…) land on your lap. Go out and ask for what you want. *The inside jokes = Sheryl explains that a career shouldn’t be called a ladder, it is more of a jungle gym… as there are more directions that just up in a successful career. The tiara is referring to the tiara syndrome, which is also discussed in the book. This last quote reminds me of a not-so-fortune fortune cookie I got the other day “Mediocrity is self-inflicted. Genius is self-bestowed.” Go out and make yourself a genius! There are so many more great lessons in this book. If you have the time (or not)… I recommend giving the full book a read! Well everyone… I am graduating! Yay! I want to thank everyone for reading these posts over the last year. Just last summer Ellen and I were sitting in her office brainstorming what to call this blog, and how to skin it… It was quite fun. I am so excited about how far it has come so quickly! As I reflect back on my time at UMD, I find there are a few nuggets of knowledge I want to leave with you all. It is easier (and possible…) to be successful when you know what you’re working towards. If you don’t know now, don’t be complacent and assume it’ll come to you. Come visit Career Services. Explore your interests. Informational interview and shadow professional in the fields you’re exploring. Set goals that are specific, measurable, attainable, realistic, and timely. Tell people about them. Then they can help hold you to the goals, but also when they know what you’re working on, they’re more willing and able to help. Dream big and set your goals to the moon. You’ll be surprised at what you are capable of. Get involved with the community and your school. It’s a great way to feel connected, to meet people who could help you one day, to have fun, and to gain experience. While I will be embarking on a new amazing life journey, I am also leaving behind a great one. It is bittersweet as I sit in the Career Services office for my final shift… This job has been the best. I have learned so much and grown as a person while holding this position. I might be biased, but I truly believe a Peer Educator for Career Services is the best job anyone could have on campus. There are fabulous people here that I will truly miss. Cell phones are a place for many things these days: sending photographs to your friend, balancing your checkbook, and even checking in for your flight. But with all of these additions, it still hasn’t lost it’s main intent: phone calls. If you haven’t yet, you’ll soon be talking on the phone with potential employers or even potential business partners. It is always important to put your best foot forward, even if they can’t see your feet. 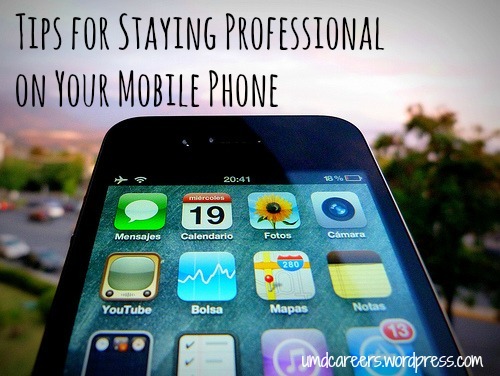 Here are some tips on how to remain professional while using your phone. Use a professional outgoing message. Eliminate distractions and background noise when using your phone. Have a fully charged battery and ample service before answering or making a professional call. Speak slowly and clearly and spell your name when leaving a message. Don’t answer your phone while driving. Don’t answer a professional call when in a public place or while engaged in a social activity. Don’t walk around while talking on your phone. Turn-off your phone while waiting for an in-person interview. If you usually review your notes on your phone, use another method so you don’t appear to be checking messages. Turn-off your phone during an in-person interview, presentation or professional meeting. Keep these tips in mind while trying to build upon your professional self! Does anyone have any other tips? This week we’ll be discussing the theme: Relator. The person with the Relator theme gets satisfaction from deep, close relationships. They know all sorts of people, and understand how to speak with them, but they have a very close group of friends that they enjoy. This theme pulls you toward people that you already know. It does not mean you’re shy about meeting new people (in fact, you could be like me and have both WOO and Relator and enjoy both! ), but you feel very strong and happy when you’re with the people you’re close with. 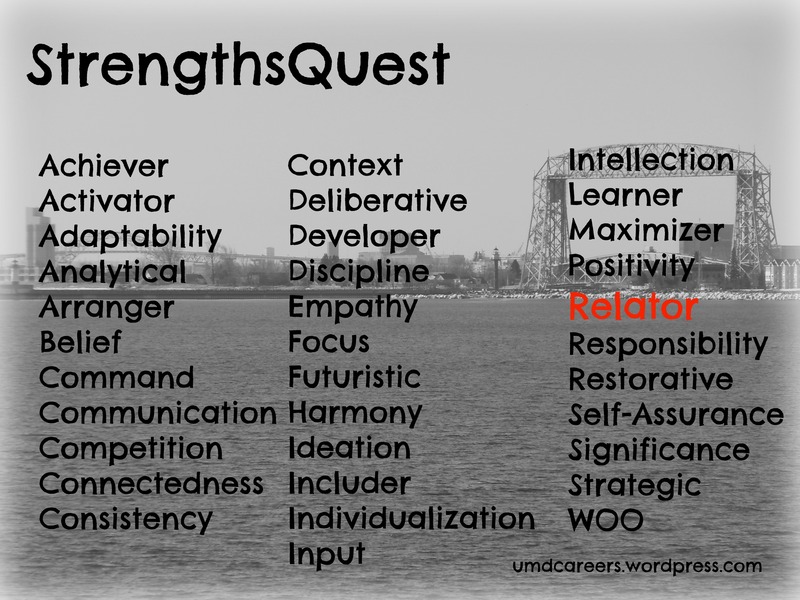 A person with Relator as a strengths theme cares about their friends. They want to know their dreams and goals because they want to help them achieve them. When their friends are happy, they get happy. This person feels that the only relationships that have true value are deep ones. They are very trusting in others. When working on a goal or project, involve others. You’ll enjoy it more! Since you tend to be at your best when you are part of a stable group of friends you can trust, join a regular study group in your challenging classes so you can stay motivated to achieve. Learn as much as you can about the people with whom you want to relate. Your interest will be a catalyst for trusting relationships. No matter how busy you are, make time for your friends. They are your fuel. Seek out advisors, counselors, and professors who demonstrate genuine interest in you as a person. Study with friends who have goals similar to yours. Become a mentor and always have a mentor. Get to know professors who take an interest in you. Choose classes that friends are taking. Your relationships with them will heighten your engagement in the classes. Become involved in campus organizations that foster friendships. Talk to your trusted circle of friends about how they see you. Don’t ask them what career they think you should choose; instead, ask them to help you see your greatest talents. Careers in which in-depth, meaningful relationships are valued are likely to be most rewarding to you. Stable work environments where you can work with people you trust but also develop multiple levels of relationships probably will bring out your best. I was just offered a real job in Marketing. I accepted it. YAY! People teach you how to write a resume, how to network, how to prepare for interviews… but rarely is the aftermath covered. I landed the career (yay), but then I was curious what was next. Here are some things that I decided to bring, and some things I forgot and wish I had. A dish of chocolate covered pomegranates – Snacks are important to keep your mind going! My lunch – It’s always safe to bring a bag lunch. You might not know what opportunities you’ll have to leave the office to grab some food on that first day. A small notebook and a pen – Taking notes on your first day will help you retain more information, and make you look prepared. That first day will be full of information. Knick-knacks – Spice up your desk space and make it your own! You will feel more comfortable. Passport – This will come in handy for the “proving who I am” business. You could also bring your driver’s license and your Social Security card. There are actually a bunch of options, but the passport was easiest for me. Checkbook – Most offices, mine included, use direct deposit to pay their employees. I brought a checkbook so that I could write down my account and routing number. Notes from the interviews – During my interviews and afterward, I took notes on ideas (which you should too!). I wish I brought them with on the first day to refer to while going through my new projects. It wasn’t a problem that I forgot these. I just did it on the second day. But if you want to be super prepared, bring them along! I also brought a few pens, post-it’s, and notepads, but the office also had a lot of those for me. I could have left them at home, but mine are cute so I don’t regret it! 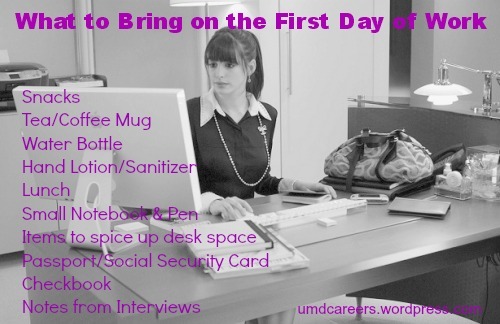 Before my first day, I also referred to the UMD Career & Internship Services Pinterest because they have boards called “Office Space,” and “Dress for Success.” Both boards were helpful with brainstorming what to bring and what to wear. I hope that this will help prepare you for your first day! Congratulations! You got an interview. Your resume did the trick, and you have won some face-to-face time. This is your time to shine. This is your opportunity to convince the hiring manager that you are the right candidate for the job. But how do you do that…? It is all about being prepared. The more prepared you are, the more engaged and interested in the position you will appear. So how do you get prepared? 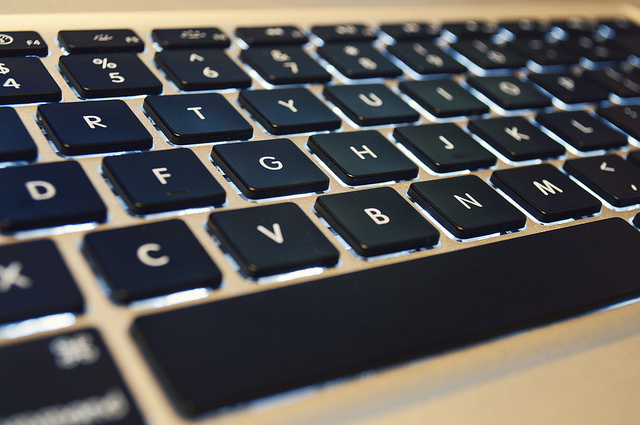 What exactly should you be researching? And where do you find this information? Keep reading, and I will tell you! The following is a list of things that you should research. Not all of these will be available for every organization, but try to find as much as you can. If you are fully prepared for an interview, you’ll feel much more confident and it will show. The employers will know that you took the time and that you care. Now that you’re mentally prepared, get physically prepared with all of our professional dress blog posts!